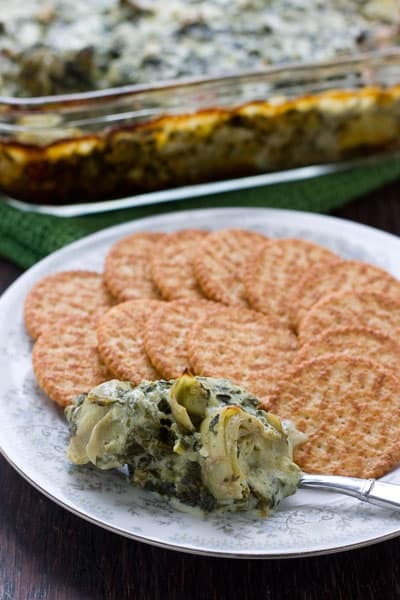 Spinach artichoke dip is my favorite appetizer dip. We first started having it in restaurants, but there were so many versions that were just downright bad. I remember ordering a spinach artichoke dip at a restaurant that was so greasy and disgusting, I had to send it back, and I hate sending things back to the kitchen. So, I was inspired to make my own version that’s not so greasy and more flavorful. I saw the idea of making this version of the dip with sour cream on Semi Homemade with Sandra Lee. Then I added more flavors first by adding a packet of Italian seasoning mix. Latter, to reduce the sodium, I ended up adding the herbs I wanted separately. I serve it with my favorite crackers, whole wheat Ritz. Preheat oven to 350 degrees. Combine all ingredients in a large mixing bowl and mix well. Pour mixture into an 8 x 8 baking dish and bake for 30 - 40 minutes or until lightly browned and bubbly. Serve with your favorite dip or cracker. I’m right there with you. I adore spinach artichoke dip…especially with a crusty loaf of homemade bread. It is dangerously delicious! Have to agree this is one of my absolute favorites…though vidalia onion is encroaching on that #1 spot for me! Love spinach artichoke dip too!!! This should have been part of myBBQ throwback…. one dangerous dip with such addicting ingredients and flavors. Thank for sharing! I too love Artichoke Spinach Dip and know exactly what you mean about it being hit or miss at restaurants! Your recipe looks fabulous. Two more things I love about you: Your random acts of kindness and the fact that you don’t rip on Sandra Lee (like most other food bloggers) 🙂 You rawk! I love Artichoke Spinach Dip. I finally got Grumpy to try artichokes earlier this year and contrary to his belief, he actually liked them! I’m thinking I could probably get him to eat this! Wow, awesome weblog layout! How lengthy have you been running a blog for? you made running a blog look easy. The overall glance of your site is great, let alone the content material! considered by some as mere extravagance.